An affordably priced replacement brake pad with great stopping power. 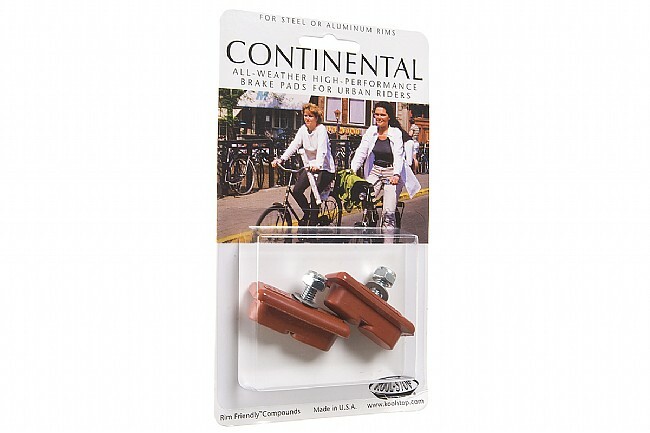 Kool Stop Continental Pads are a good choice for bikes with tight clearances that don't accommodate new pads or holders. Salmon compound provides great wet weather performance on alloy or steel rims. Threaded posts only. One pair per set. Was looking for something special and I got it! Needed something to give me great stopping power for my steelie that also looked great and these were perfect. No complaints, easy to install and I can stop on a dime now, which is especially important because I commute in an urban environment. Steel Rims? You NEED these pads. These pads just saved my life. I was riding my steel rim Raleigh in a wet drizzle. A car zipped out of a blind driveway - neither of us had vision on the other until it was too late. Panic stop but the pads stopped me INSTANTLY. If had been using the stock black rubber brake pads I'd be in the hospital now. Thanks Kool Stop! This is my second set of Kool Stop brake pads. They work very well on my alloy wheels. Good pads for wet weather especially on my front wheel. I ride down a few big hills every morning and these do the job. Only brake pads that will stop a steel rim in the rain. Kool Stop Continentals A friend turned me onto them for vintage bikes with steel rims. They are the only pads I've found that will stop a steel rim in the rain! I have to file them fit the angled rims on most of my bikes (Schwinns). I've since tested them on alloy rims and the work great as well. As my good friend Nick once appropriately put it, Kool Stop or no stop. They work great, they stop my older bike, what else can I say! Excellent performance with an economical price. Used to replace aging pads on an older Bianchi that was converted to a an upright city bike, worked great. I've used Coolstop brand brake pads in the past, which led to this purchase because their brake pads really do work great. Going from 35 year old, dry-rotted pads to Coolstop's pads was an incredible difference. I could barley even stop before and now I can leave tread on the roadway! Kool Stop always makes a great product, and these pads are no exception. I put them on a vintage steel Centurion road bike for a friend of mine. They look correct on the bike and improve braking considerably over the old cracked originals. The is well worth the investment. 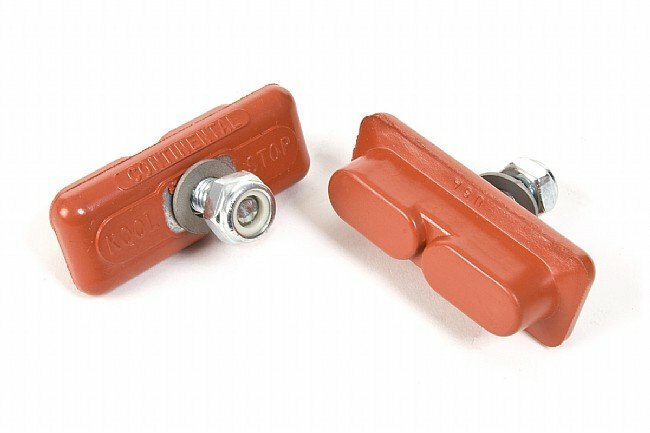 Kool Stop pads are a great improvement to any rim brake setup, and these are a great buy for older bikes. Even older bikes need new brakes. Using these on a 32 year old, in great condition, bike. Does the job. Very sticky and good looking replacement for my old school Schwinn Varsity. Bought them for their older look and almost direct replacement of originals. Biketiredirect.com has great shipping. Got my order in two days.